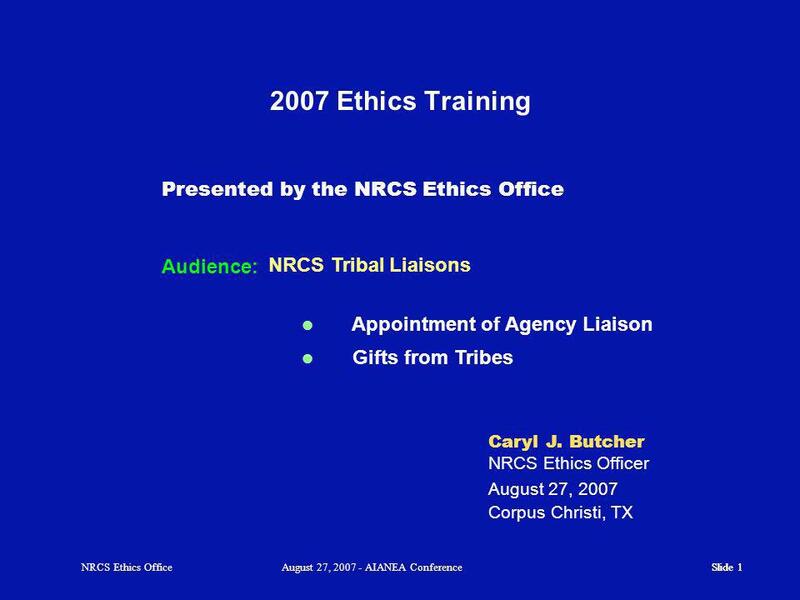 Slide 1 NRCS Ethics OfficeAugust 27, 2007 - AIANEA Conference NRCS Tribal Liaisons 2007 Ethics Training Audience: Presented by the NRCS Ethics Office Caryl. 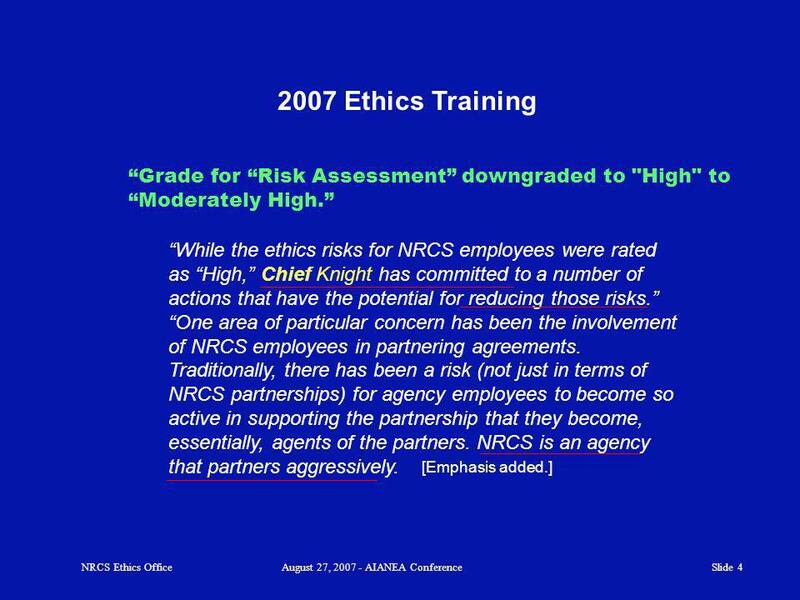 3 Slide 3 2007 Ethics Training Recap NRCS Ethics OfficeAugust 27, 2007 - AIANEA Conference Ethics risks are much higher than in most Agencies Employees become so active in supporting the partnership that they become, essentially agents of the partners. Yes, that is a problem ! 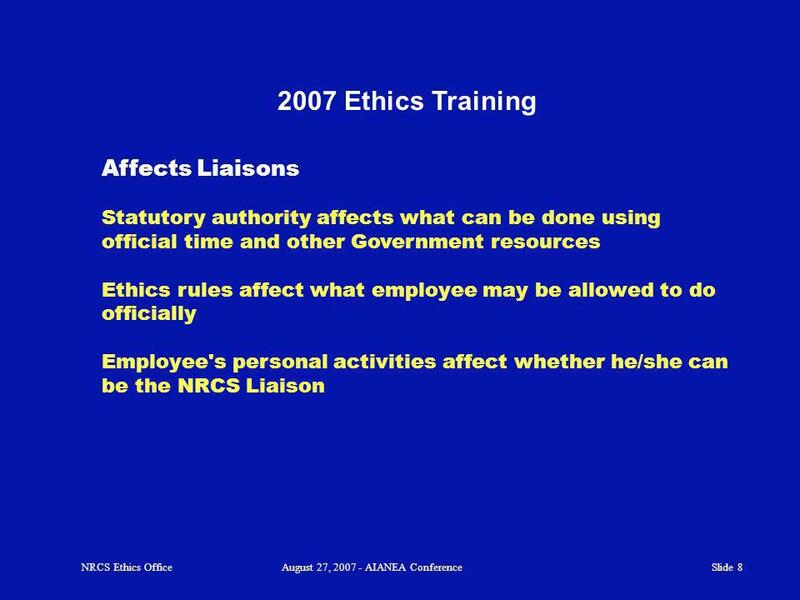 12 Slide 12 2007 Ethics Training Reoccurring questions NRCS Ethics OfficeAugust 27, 2007 - AIANEA Conference Questions arise about certain special statutory exemptions of interest to Tribal Liaisons COI exemption related to Indian birthright Does not exempt employee from following the same rules as for all other employees based on seeking non- Federal employment The exemption is at 18 USC 208(b). 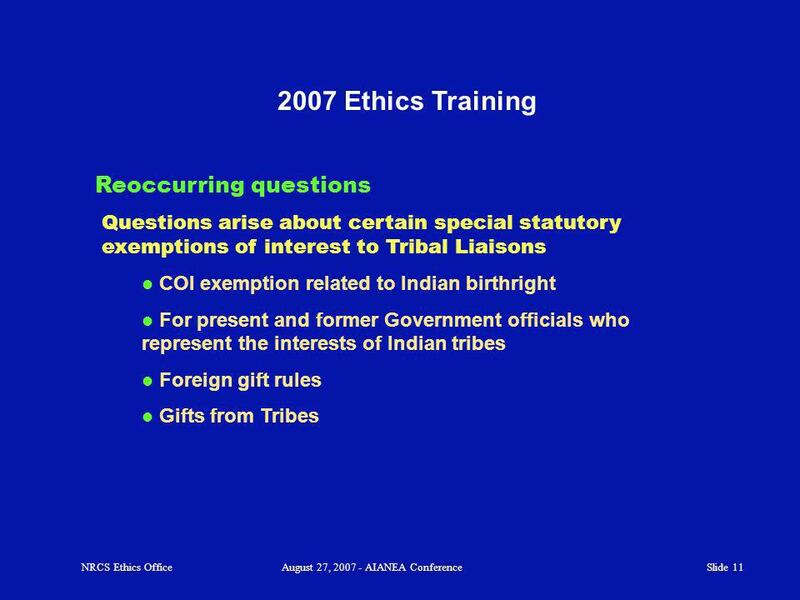 (b)(4) contains an exemption for financial interests arising solely out of birthrights in an Indian tribe. 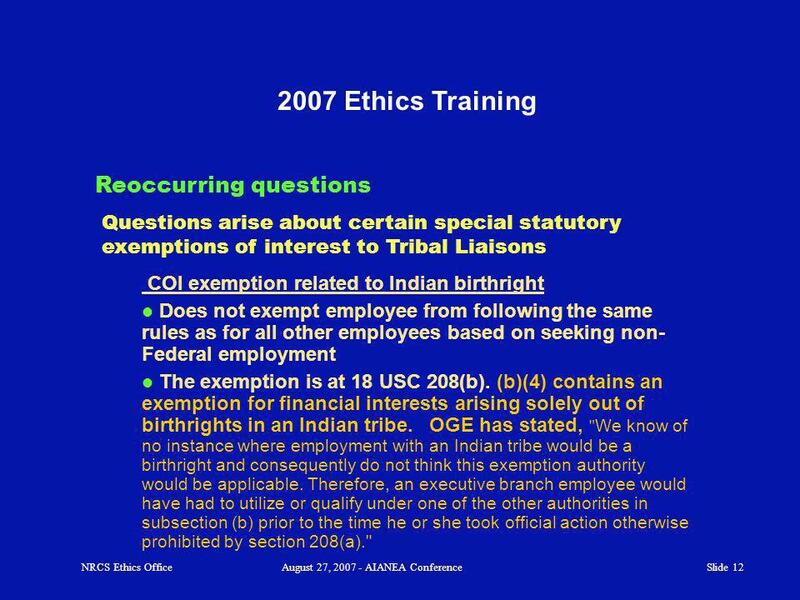 OGE has stated, " We know of no instance where employment with an Indian tribe would be a birthright and consequently do not think this exemption authority would be applicable. 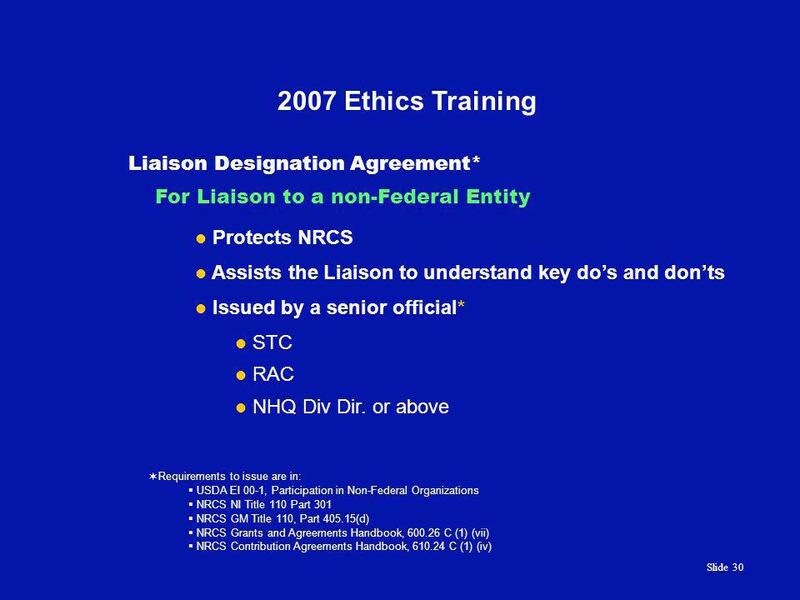 Therefore, an executive branch employee would have had to utilize or qualify under one of the other authorities in subsection (b) prior to the time he or she took official action otherwise prohibited by section 208(a)." 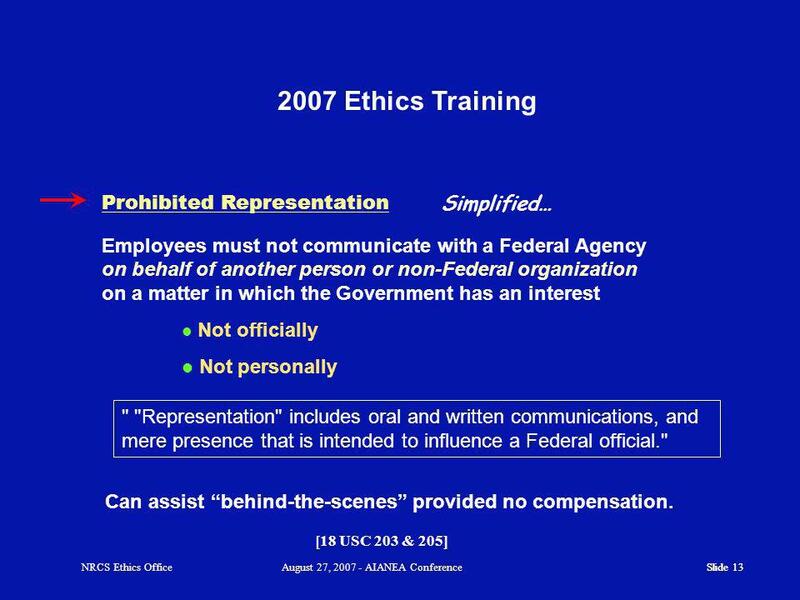 13 Slide 13 2007 Ethics Training Slide 13 Employees must not communicate with a Federal Agency on behalf of another person or non-Federal organization on a matter in which the Government has an interest Simplified… [18 USC 203 & 205] Prohibited Representation Can assist behind-the-scenes provided no compensation. 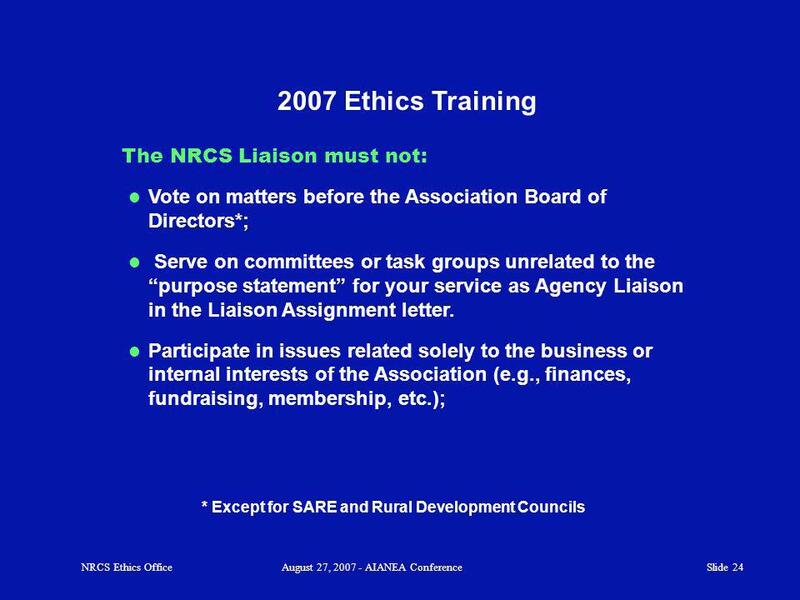 Not officially Not personally NRCS Ethics OfficeAugust 27, 2007 - AIANEA Conference " "Representation" includes oral and written communications, and mere presence that is intended to influence a Federal official." 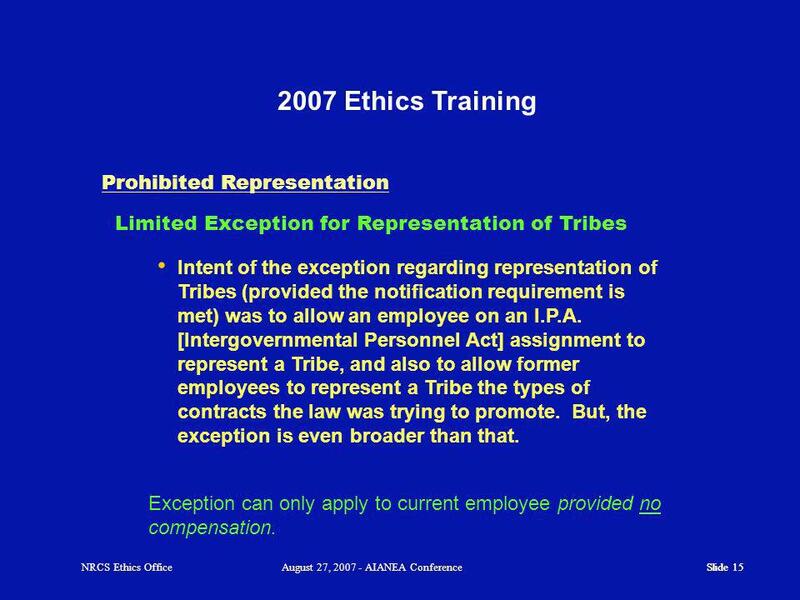 15 Slide 15 2007 Ethics Training Slide 15 Prohibited Representation Intent of the exception regarding representation of Tribes (provided the notification requirement is met) was to allow an employee on an I.P.A. 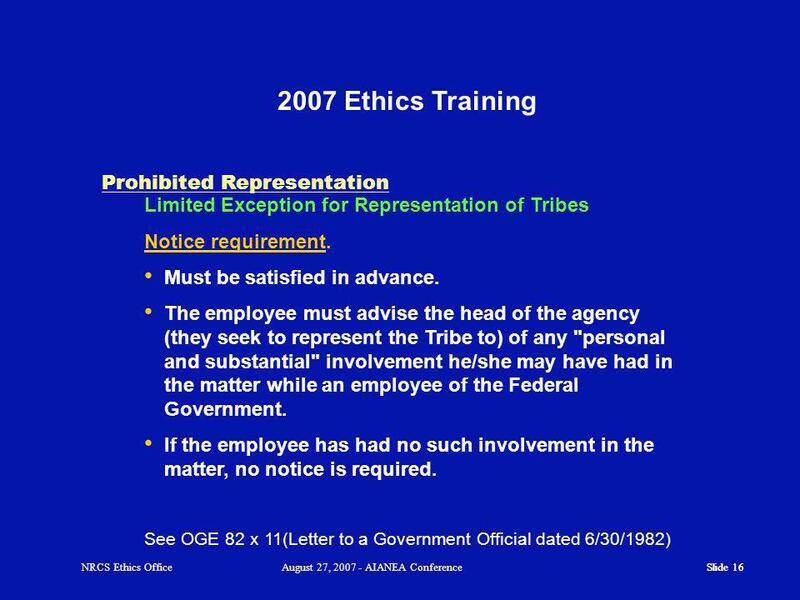 [Intergovernmental Personnel Act] assignment to represent a Tribe, and also to allow former employees to represent a Tribe the types of contracts the law was trying to promote. But, the exception is even broader than that. 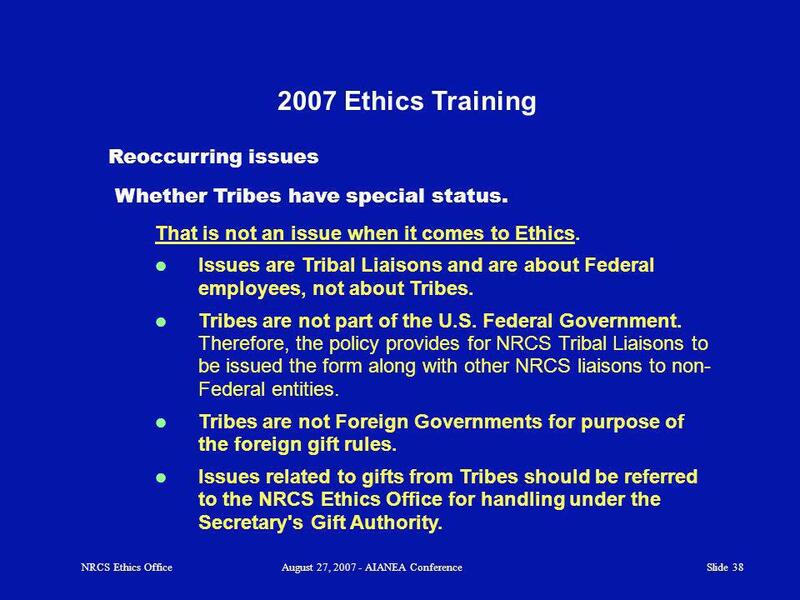 Limited Exception for Representation of Tribes NRCS Ethics OfficeAugust 27, 2007 - AIANEA Conference Exception can only apply to current employee provided no compensation. 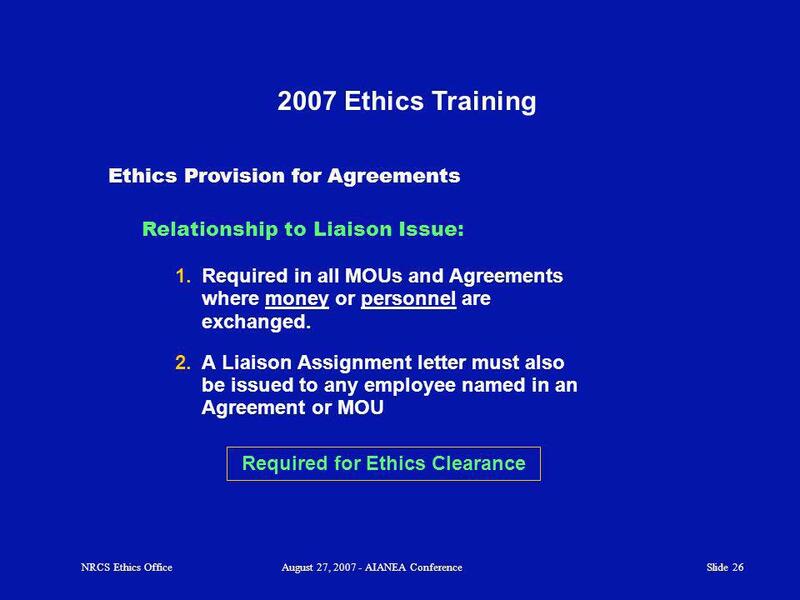 32 Slide 32 2007 Ethics Training What should you do? 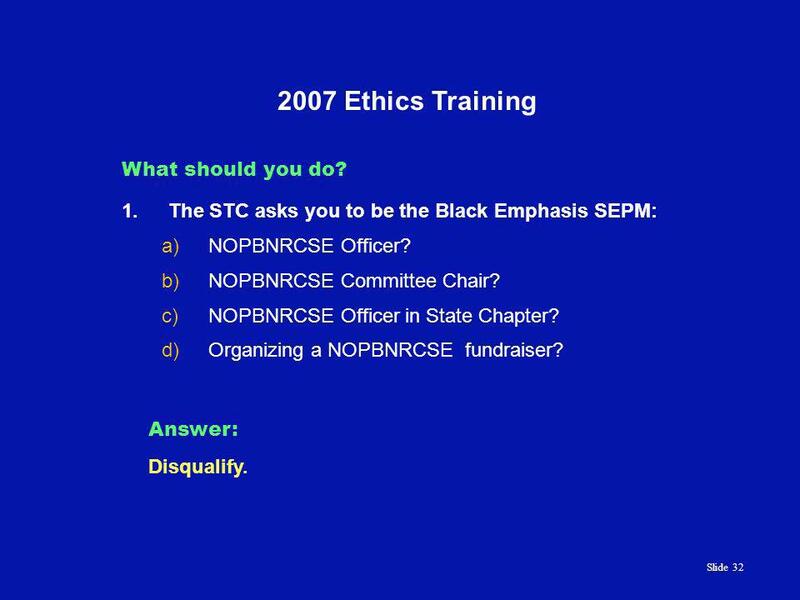 1.The STC asks you to be the Black Emphasis SEPM: a)NOPBNRCSE Officer? b)NOPBNRCSE Committee Chair? c)NOPBNRCSE Officer in State Chapter? 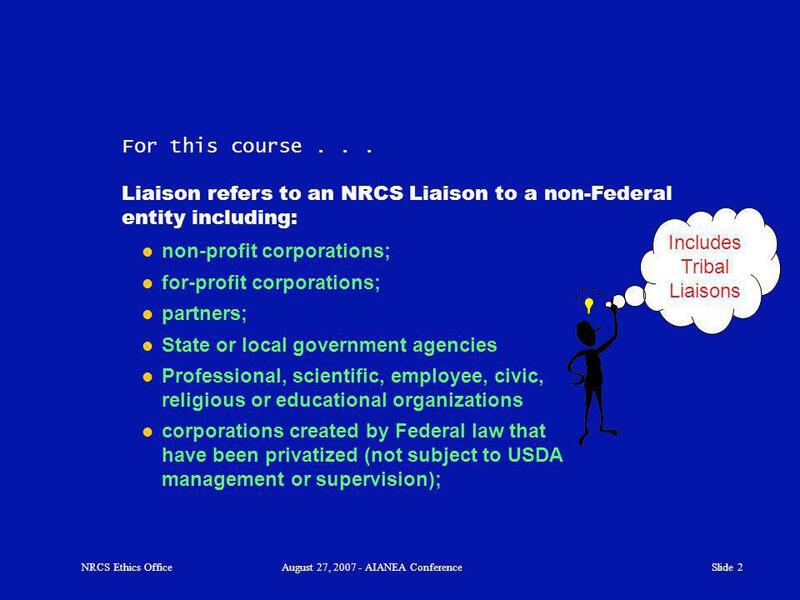 d)Organizing a NOPBNRCSE fundraiser? Answer: Disqualify. 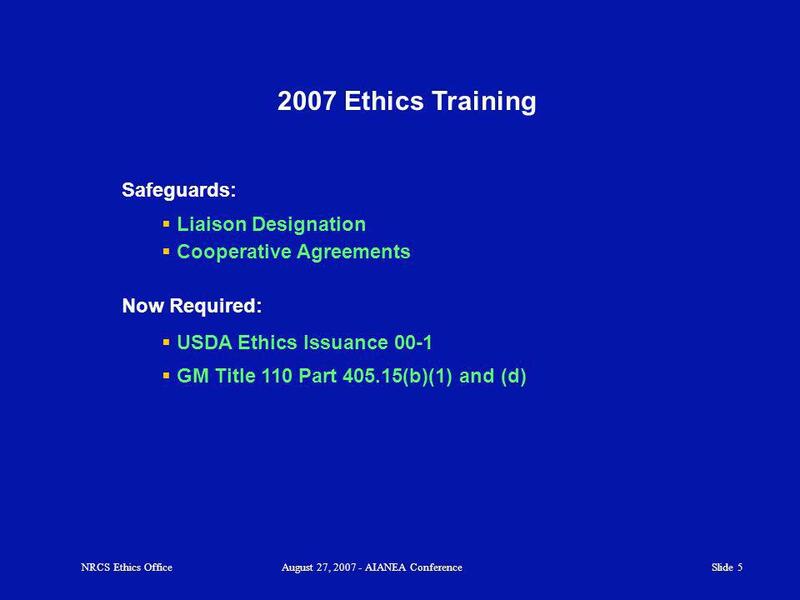 33 Slide 33 2007 Ethics Training What should you do? 1.You are the Indian/Alaska Native Special Emphasis Program Manager. 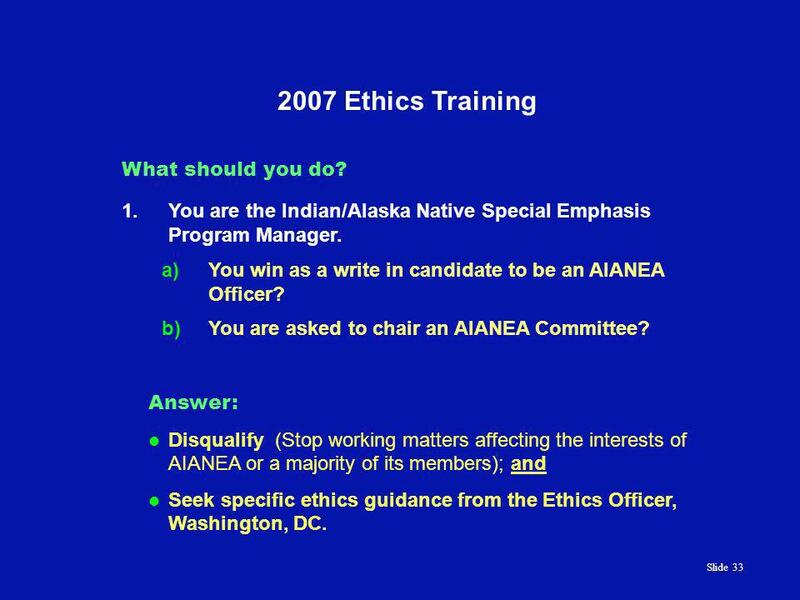 a)You win as a write in candidate to be an AIANEA Officer? b)You are asked to chair an AIANEA Committee? 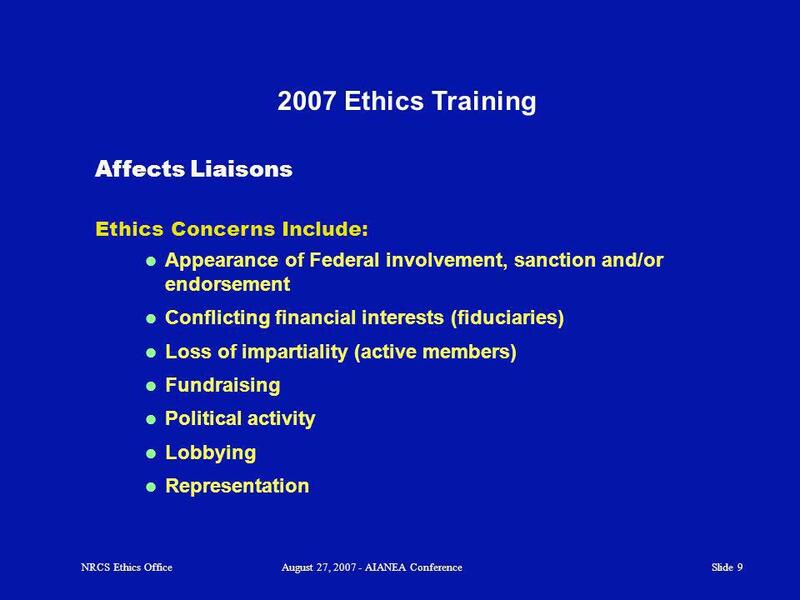 Answer: Disqualify (Stop working matters affecting the interests of AIANEA or a majority of its members); and Seek specific ethics guidance from the Ethics Officer, Washington, DC. 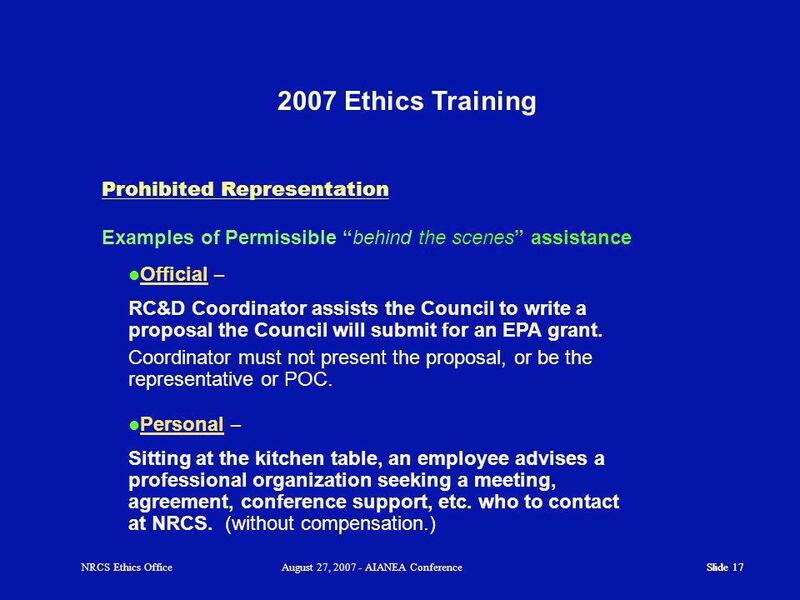 34 Slide 34 2007 Ethics Training What should you do? 2. You are the Tribal Liaison. This has been a good assignment for you and your family but your spouse has been getting a bit bored. When you returned home from a recent Conference you learned your spouse got a job with the Tribal District. Answer: Disqualify. You can not work on matters likely to affect the Tribes interest. Either: Spouse voluntarily resigns from the job with the Tribe. STC reassigns you to another position. 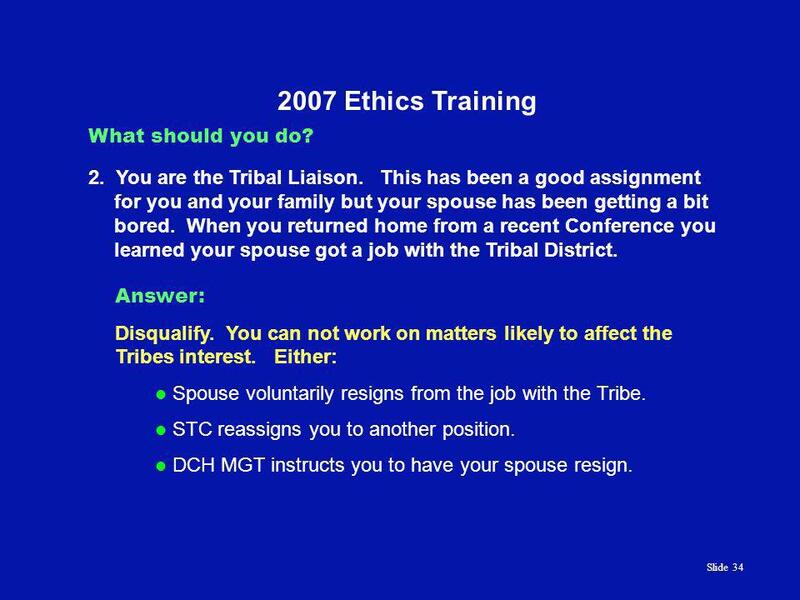 DCH MGT instructs you to have your spouse resign. 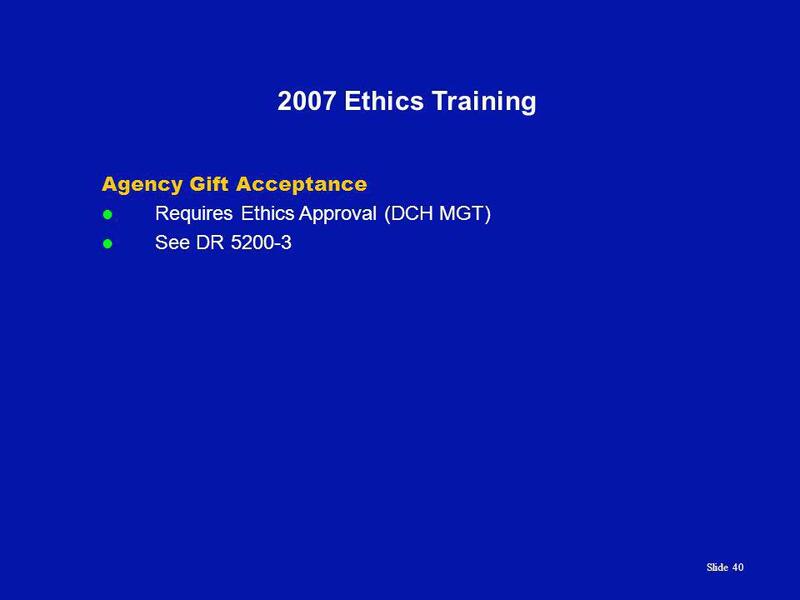 35 Slide 35 2007 Ethics Training What should you do? 3. You have been a member of SWCS for years. You used to be more active, even serving as Chair of the Conference Committee in past years. 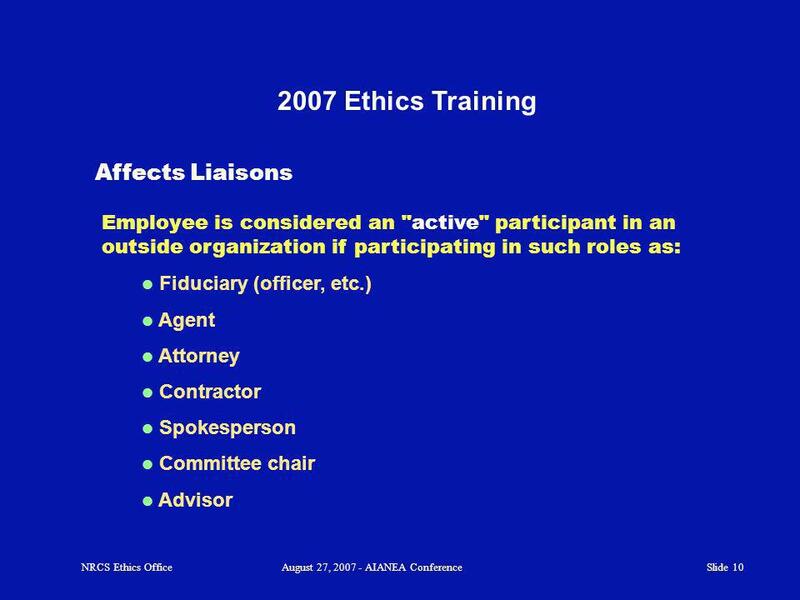 In recent years, however, you have been willing to serve on a committee but not as committee or subcommittee chairperson. The STC asks you to work with SWCS to coordinate matters dealing with the Agencys involvement with their upcoming training conference, including the list of employees to be approved to attend. Answer: You can accept the assignment. Tell STC which Committee you are on. 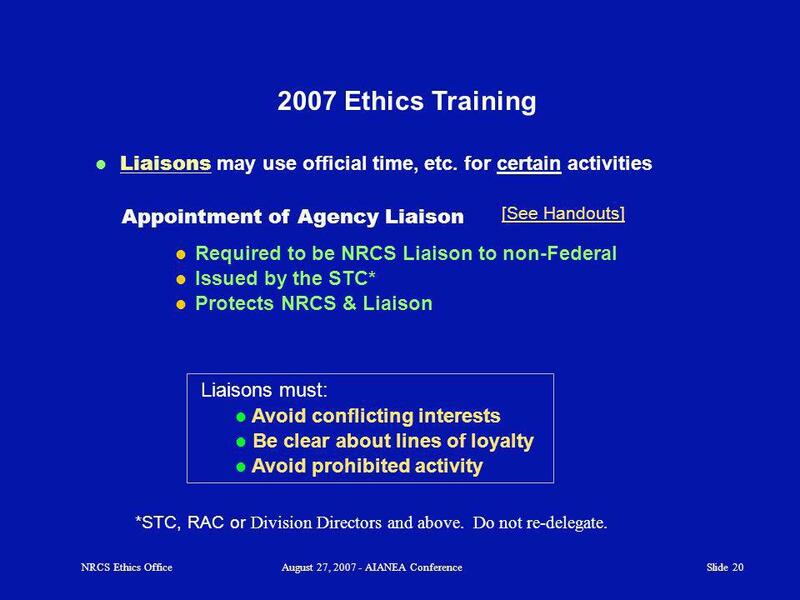 If it raises a concern about your service as Liaison, STC will not appoint you if you remain a committee member. 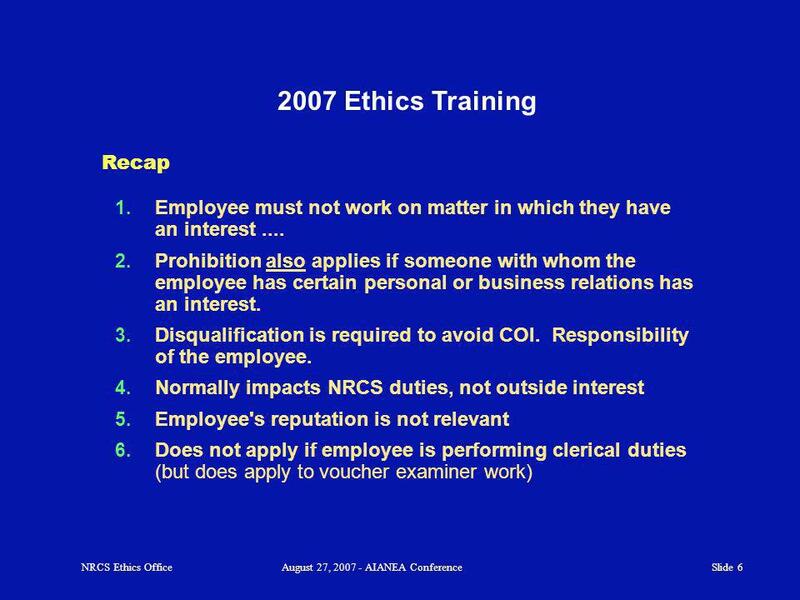 36 Slide 36 2007 Ethics Training What should you do? 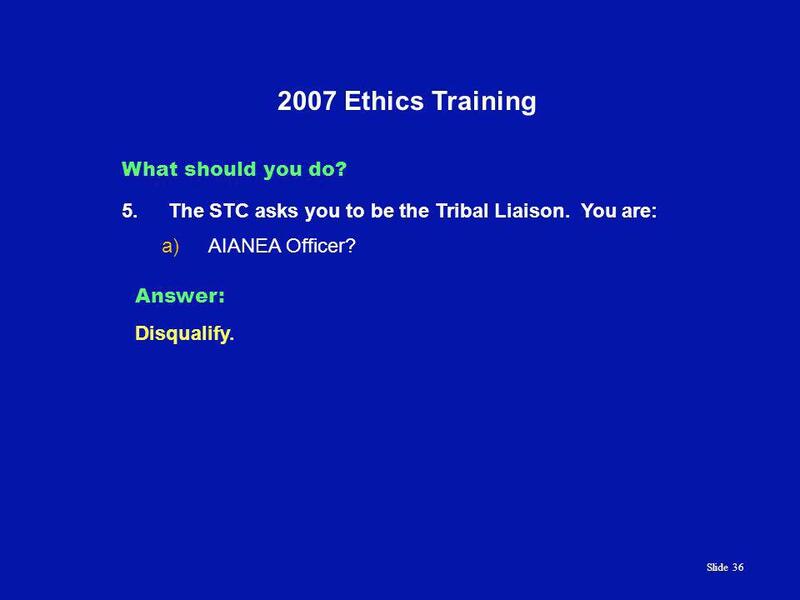 5.The STC asks you to be the Tribal Liaison. You are: a)AIANEA Officer? Answer: Disqualify. 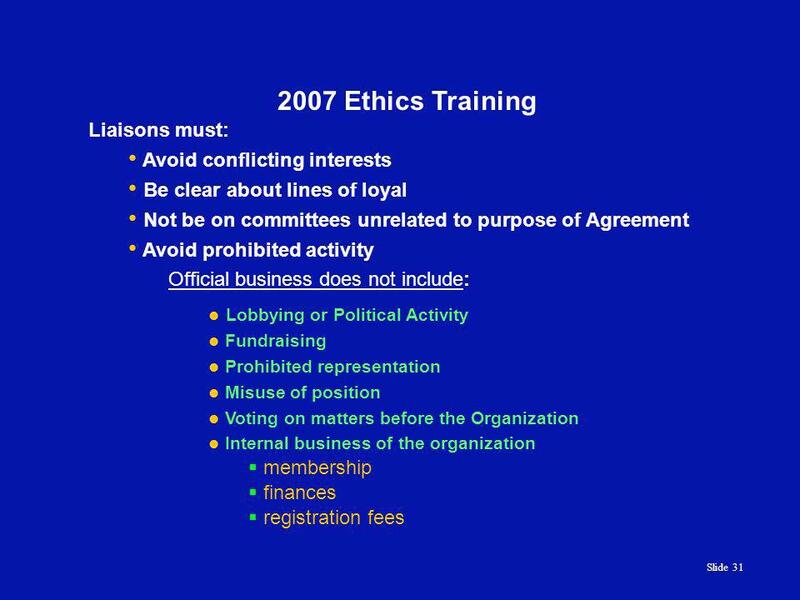 37 Slide 37 2007 Ethics Training What should you do? 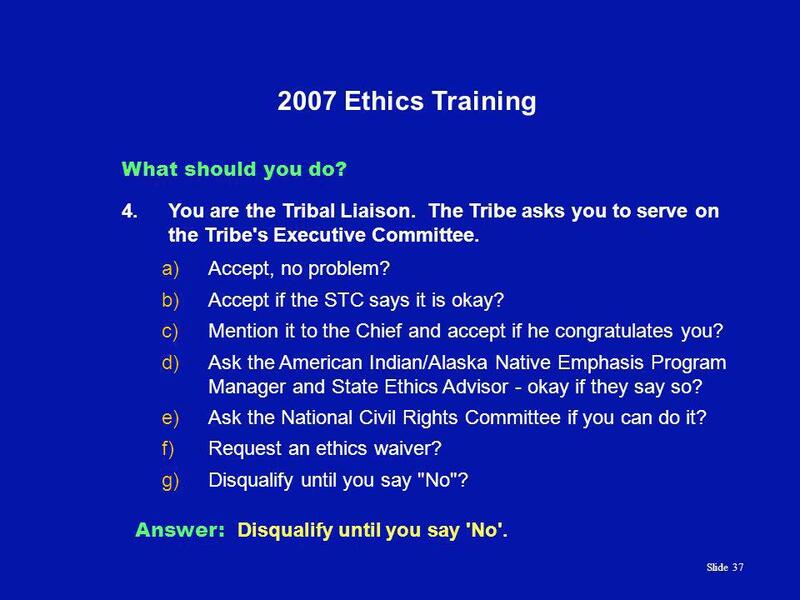 4.You are the Tribal Liaison. The Tribe asks you to serve on the Tribe's Executive Committee. a)Accept, no problem? b)Accept if the STC says it is okay? c)Mention it to the Chief and accept if he congratulates you? 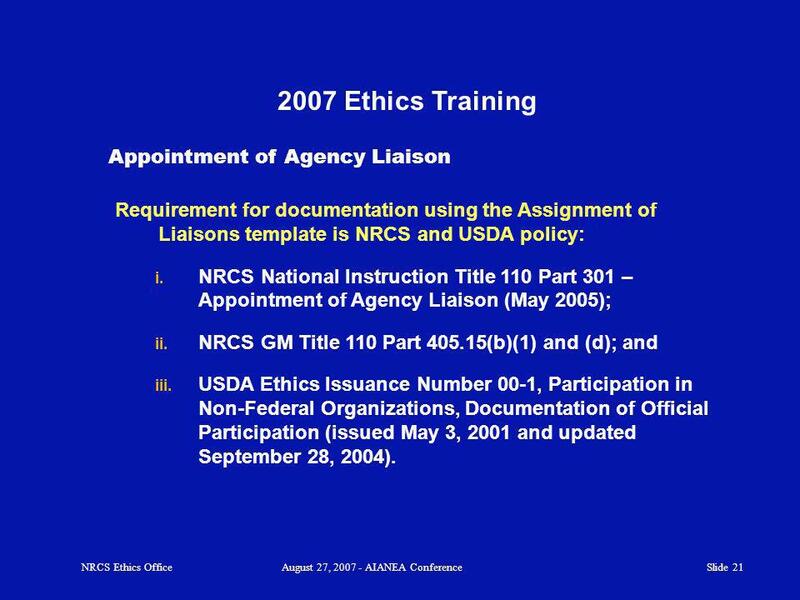 d)Ask the American Indian/Alaska Native Emphasis Program Manager and State Ethics Advisor - okay if they say so? e)Ask the National Civil Rights Committee if you can do it? 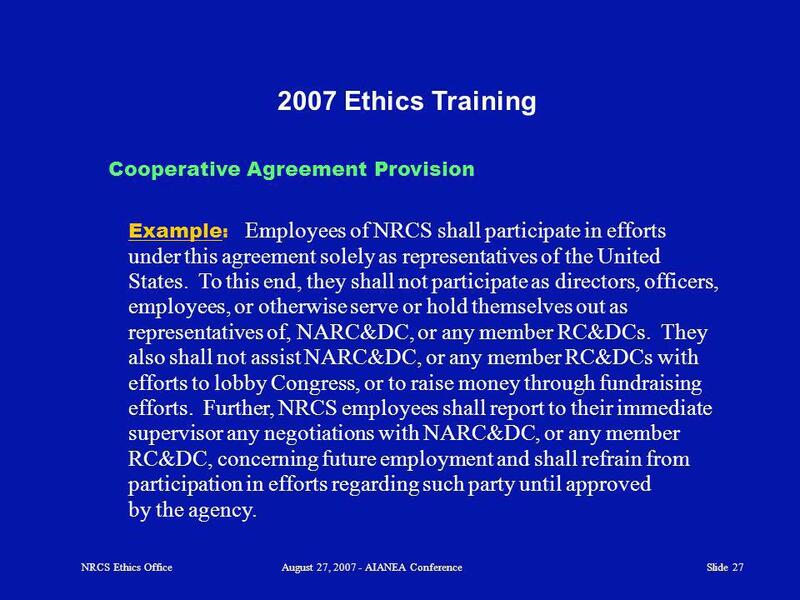 f)Request an ethics waiver? 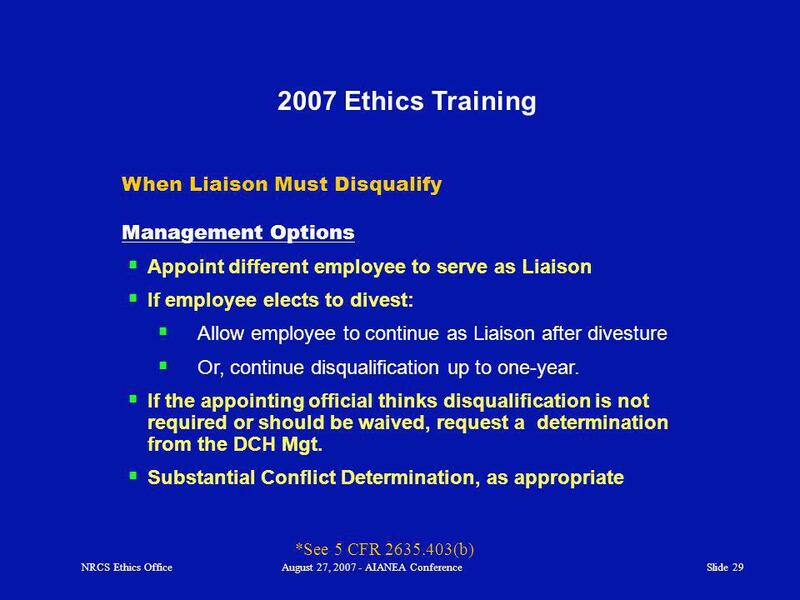 g)Disqualify until you say "No"? Answer: Disqualify until you say 'No'. 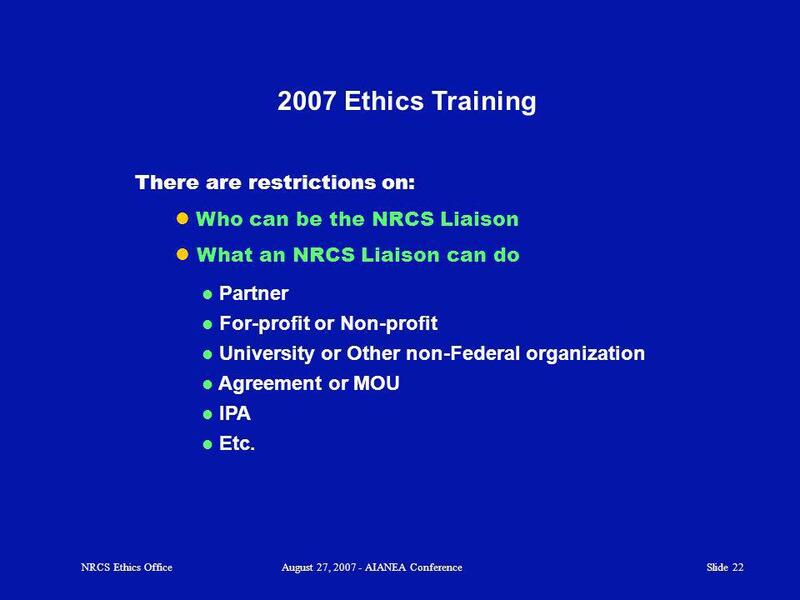 39 Slide 39 2007 Ethics Training Self-Test Can an employee be NRCS liaison to an organization if: Officer or member of the board of directors? Committee or subcommittee chairperson? Leading an activity for the organization? Member? 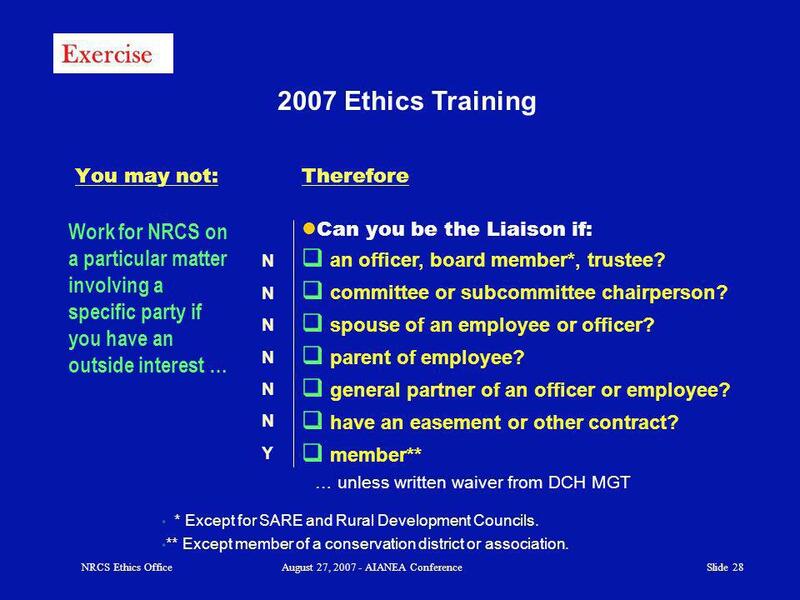 No * No Yes** * Except for SARE and Rural Development Councils ** Except if member of Conservation District or association. 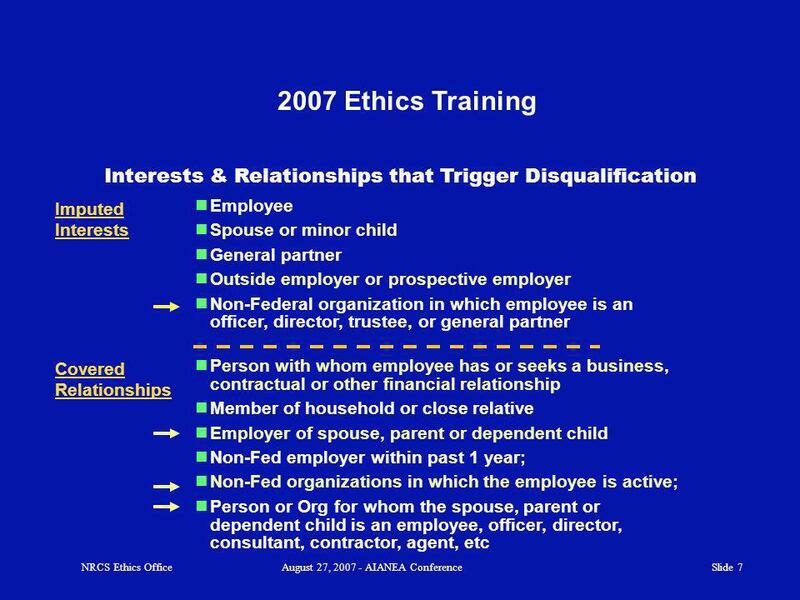 Employees spouse (or parent) is Board member? Consultant? Employee? No. 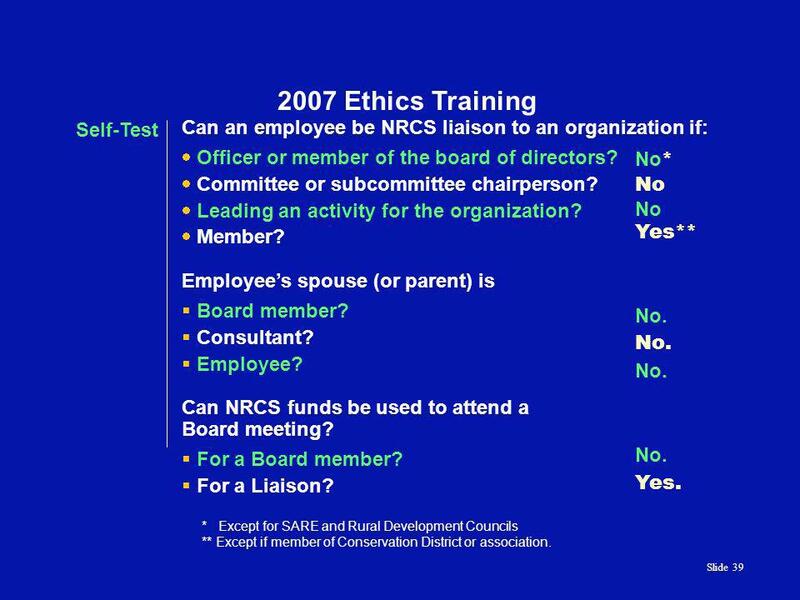 Can NRCS funds be used to attend a Board meeting? 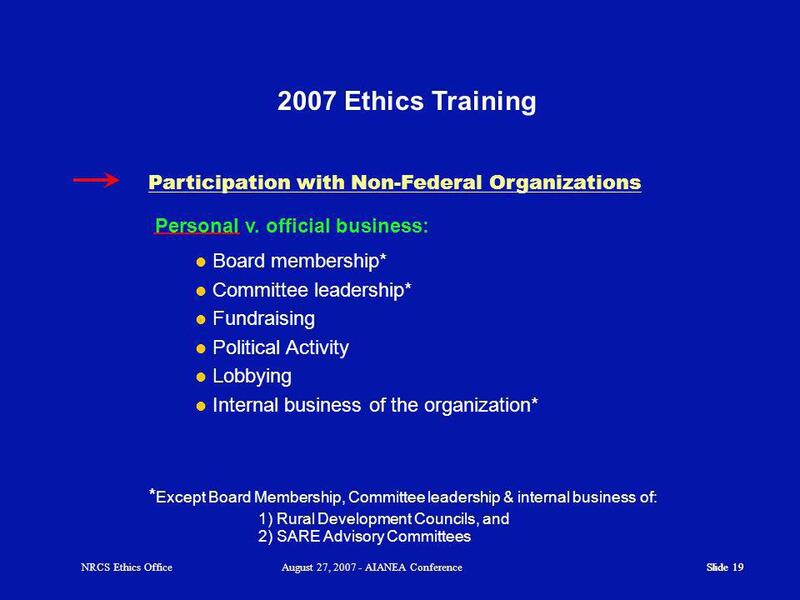 For a Board member? 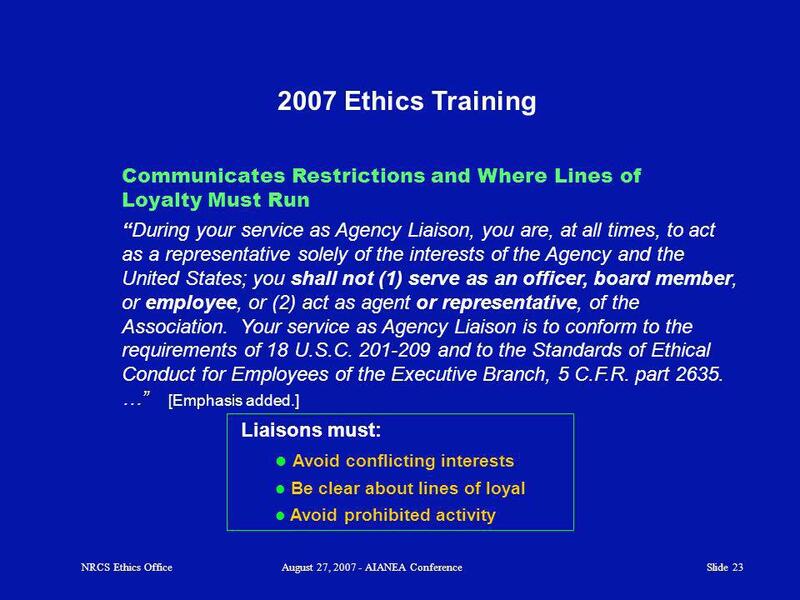 For a Liaison? No. Yes. 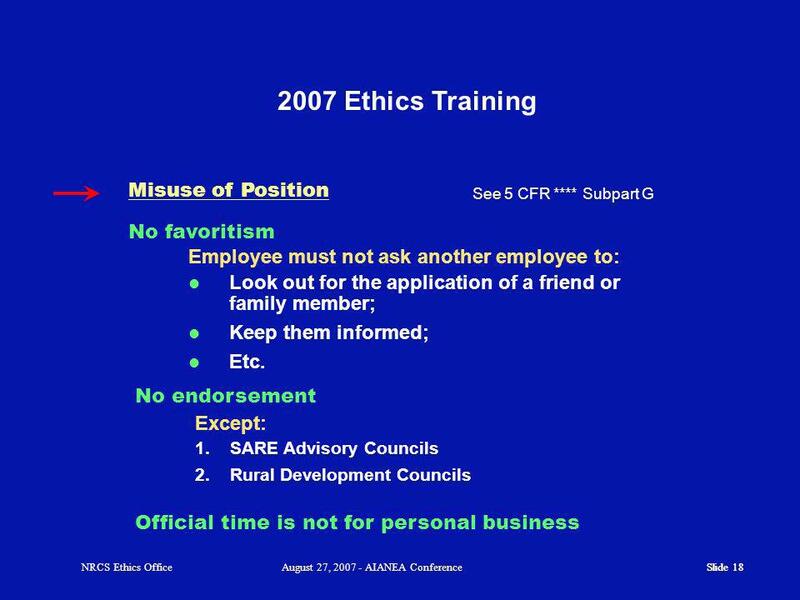 41 Slide 41 2007 Ethics Training Sign the sign-in sheet Satisfies Filer's CY 2007 Training Requirement Slide 41NRCS Ethics OfficeAugust 27, 2007 - AIANEA Conference Questions? 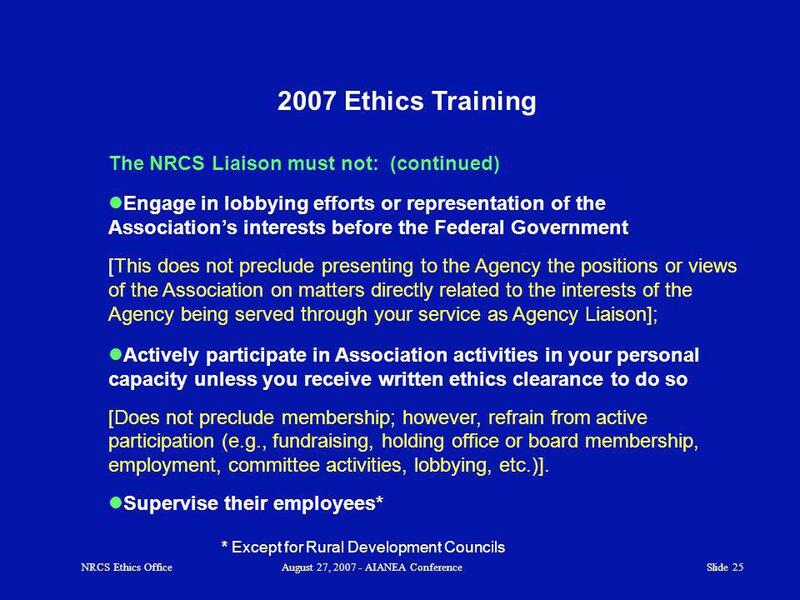 Download ppt "Slide 1 NRCS Ethics OfficeAugust 27, 2007 - AIANEA Conference NRCS Tribal Liaisons 2007 Ethics Training Audience: Presented by the NRCS Ethics Office Caryl." 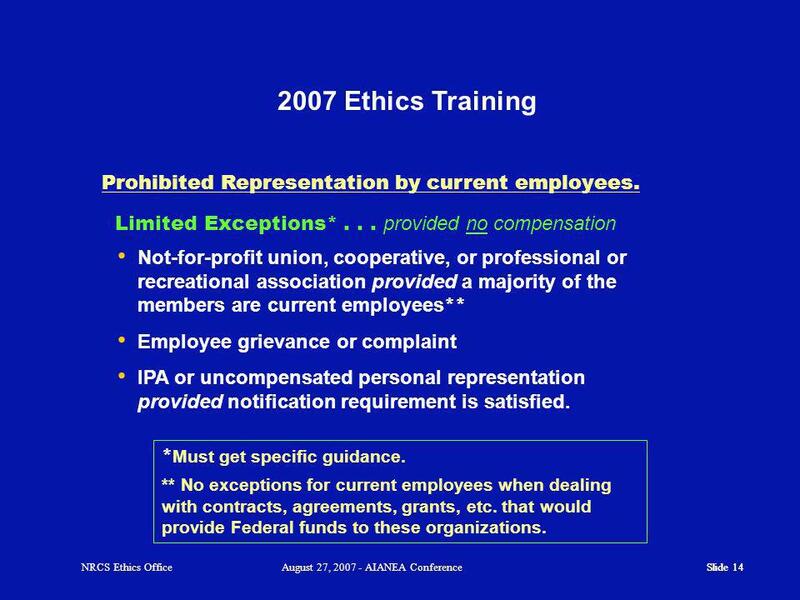 Ethics Briefing for Special Government Employees Serving on NASA Advisory Committees.